I used the February Swirlydoos kit for this layout. This kit is one of my all time favourites to date. I absolutely love the vintage colours and embellies that Krissy put together. I used the fabulous sketch that came with the kit and am delighted with how it turned out. 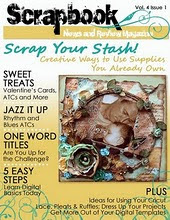 This was also featured in the April issue of SNR for the scrap your stash (Flowers) call. I used a photo technique I learnt from my very ggod friend Lisa Valentine which I'll be posting a short tutorial for in the very near future. The tones of the TPC pp's complimented the picture perfectly. I matted the pic with some pp's that I used my Martha Stewart border punch on. This gorgeous Prima bloom complimented the pp's perfectly and then I added some Hydrangeas that I got from iamroses.com which I misted with some of the tattered angels mist that came with the kit. The smaller peach Prima blooms have been in my stash forever so I was excited to see I could finally use them. I pasted a piece of cardstock over the mirror part of the frames that came in the kit and stamped my title using some JustRite stamps. The ribbon was also from my stash. Anyone who knows my work, knows I LOVE distressing so of course I had to throw in some water distressing here and there to finish it all off. I'll be posting some water distressing techniques in the very near future so if you wan to learn the technique then check back soon. wow........this is just beautiful. Love all your distressing and punching, just adorable.